Around May to June of last year I was considering retirement. But, as my new partner was not thinking in terms of mergers and acquisitions, we ended up producing a twenty-year business plan and I signed the contract. I did lose ownership, but on the other hand, I feel like I've been relieved of a heavy burden. There won't be any family battles over money issues involving the inheritance or the stock. Physically, too, I feel ten times better than I did last year. I consider this turning-point the beginning of my final chapter. The dissonance increases with age. We begin to hear quite clearly the sounds of our cells as, one by one, they die. When this happens that creature known as man begins to seek the final stage of that growing dissonance. The process is all the more troubling for one who has lived his life in the key of A minor for he will begin to search for a solution. "What 'solution'?" The woman questions me again. A way to die. Your way to die. "To collapse right in the middle of work, be carried to the hospital, to be diagnosed with some grave illness, and pass into the beyond a few days later. That would be ideal." Yamamoto enters what he considers the final chapter of his life, yet far from showing a fear of death, there is simply a cosy sweater. It is not the seeking of a grand finale, but rather a peaceful acceptance of a blunt reality. 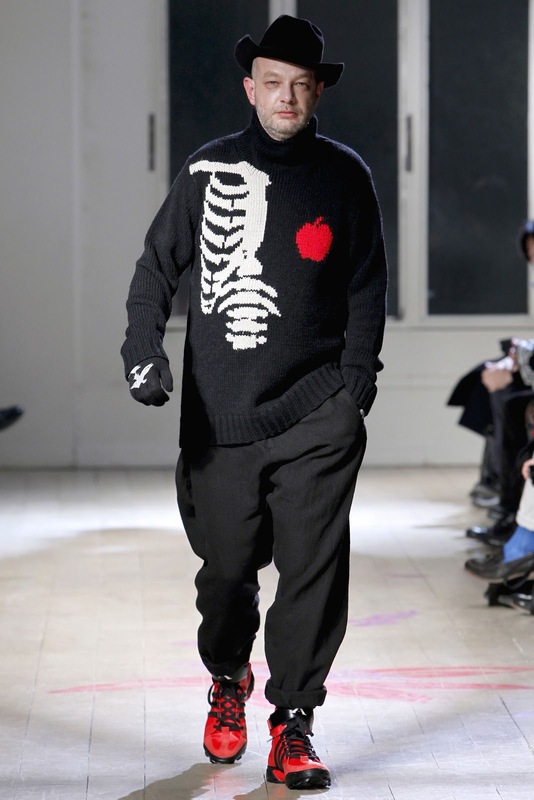 I thought the collection was interesting in the friendly nod towards death, as if waiting for an old friend, and the fact that Yohji referenced his past collections. It actually reminded me of something Rick Owens said to Maria Luisa in an interview. His father once asked him whether he was afraid that he would one day run out of ideas, to which Rick replied no - for everything he would ever design was already there in his collections, he just needed to reveal them to himself. 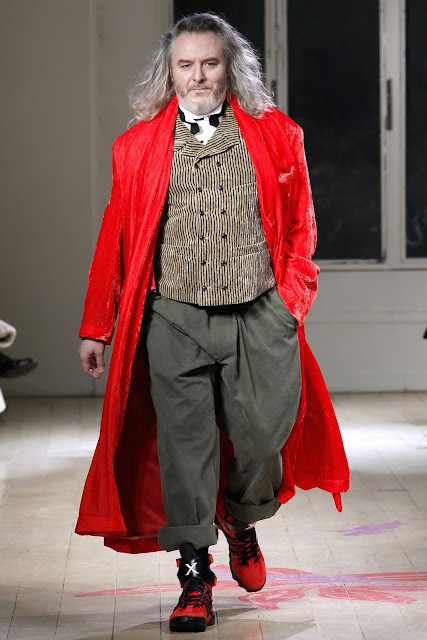 This was actually my favourite look of the season from Paris. I loved the soft collar and angle of the spread of the shirt. In terms of shirting I am quick to recommend people to buy the +J shirts Jil Sander creates in collaboration with Uniqlo, as they are the best quality you can find at that price point. Jil actually sources the cotton from the same mills that produced her fabrics when she was designing at Jil Sander (now designed by Raf Simons), meaning that the quality is immediately apparent when handling. One caveat I do however have about those shirts is the acute angle of the spread, which although thoroughly modern and certainly very Jil, is somewhat less versatile in design. My second recommendation is to head to Muji to buy some of their organic cotton shirts. Whilst perhaps less crisp and modern, they have a softness and elegance that works well with a suited look. The collars are also something I really like, for they have a soft collar with a nice spread that works well both with and without a tie. Of course the other danger is having a spread that is too wide, hence being unwearable without a tie, however Muji find the perfect middle-point. It is perhaps not surprising to hear that Yamamoto actually serves of the advisory board at Muji. 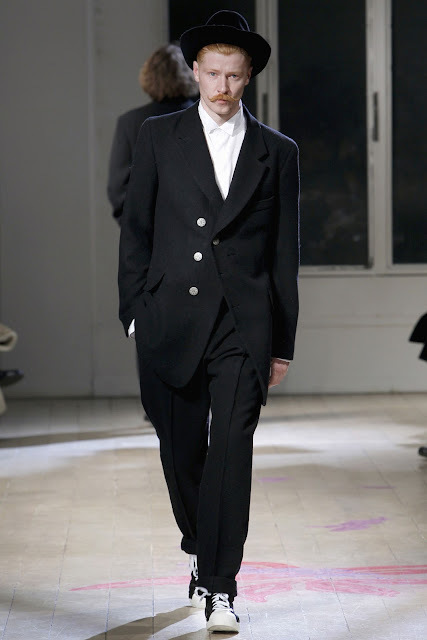 The shirt blazer really intrigued me, with its flat lapel and hidden buttons. Lightweight and cut in a typically Yamamoto-fashion, it seems perfect for Spring. The volume and shape of the trousers also stood out, especially the taper towards the ankle and cuff. There is certainly something to be said for wider cut trousers, and although I am not ready to part from my skinny cut Drkshdw jeans, I would quite happily include both silhouettes into my wardrobe. 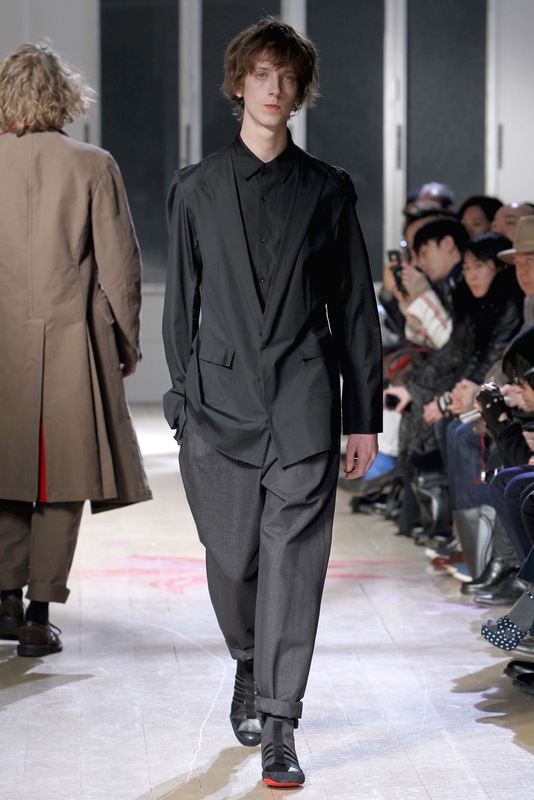 I was particularly fond of Yohji's styling with the trainers from his Y3 line (I may actually do a post on Y3 in the near future). 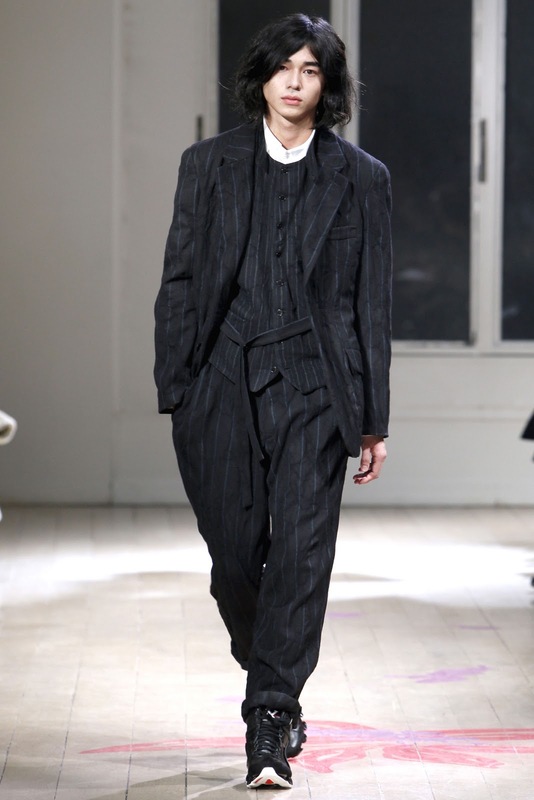 Although many people seem to think the collection would have worked better with different footwear, I think Yohji is someone who bridges the gap between tailoring and sportswear better than almost anyone else in fashion. They lent a casual elegance and comfort to the collection that worked perfectly with the ease of the shapes. Plus I loved the sliver of red from this look in motion. I completed the course and began working at my mother's dressmaking shop. Elegant madams would come into the shop with magazine clippings, asking us to make them the outfits they saw there. Hourglass figures they had not, but I diligently took their measurements as I grumbled silently to myself about the impossibility of reproducing the magazine look. I hated it. 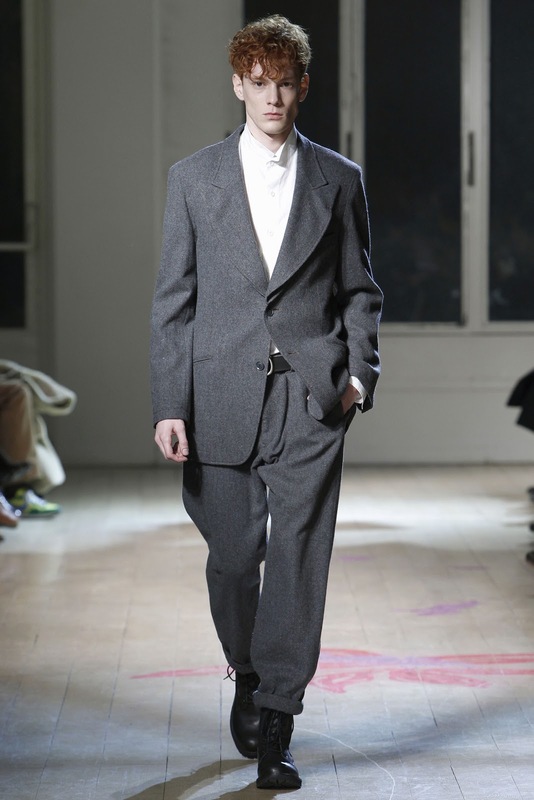 Larger and mature models are not uncommon on the menswear runway, however they often feel forced and gimmicky. For Yamamoto however the sight is by now an established routine. He is sincere in the way he designs for all body shapes and ages, admiring the beauty and charm of all shapes and sizes. Perhaps it is simplistic to tie the tendency to his youth where he was asked to create dresses for women woefully ignoring their own body shapes, but there is something about his insistence on all types of model that really makes me smile. 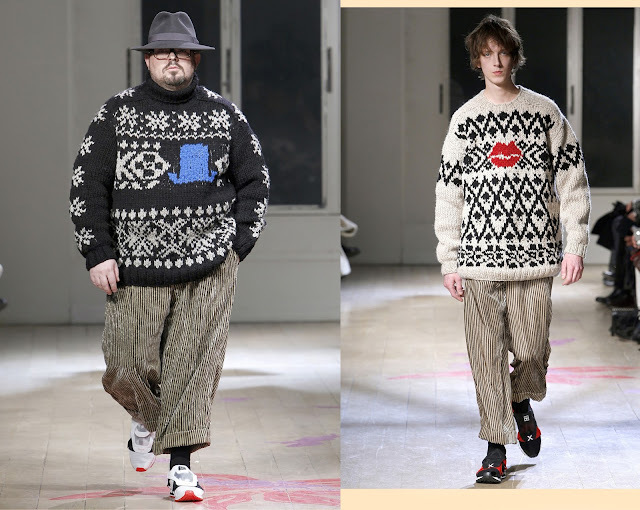 Indeed he actually sent two almost identical looks, one on a larger and more mature model, the other on a young and slim model, down the runway, and the comparison was stylistically a valid one. I think it looked great on both models. I really like the fact that he uses such a large group of different men. Not just sizes but types. I actually enjoy the choice of models, and the choices of footwear. 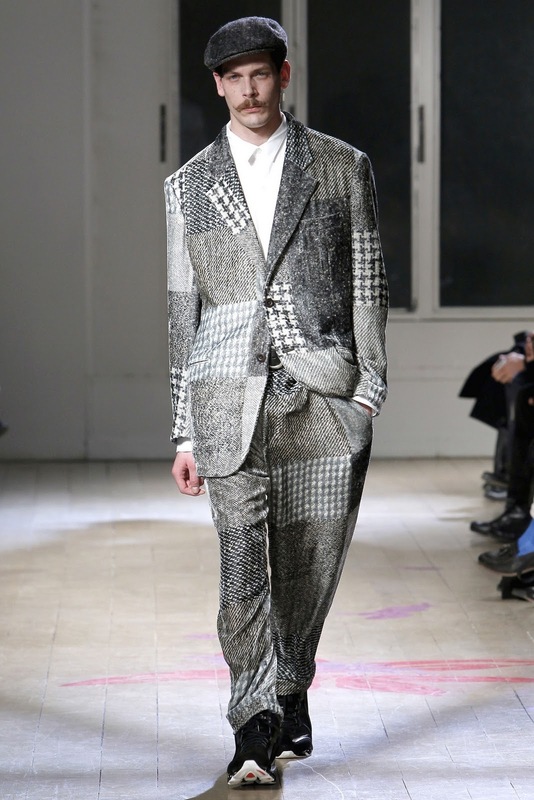 Other designers couldn't pull this off the way that Yamamoto does - maybe it's because he's quite confident in his product, but something about every single look, and every single model is quite appealing. Hopefully he'll be around for much longer - I could let at his designs forever! So clever. Love the fun part of it too. Loved the letter at the beginning and the sentiment from Rick Owens that he simply had to reveal the ideas he's had inside of him all along to himself. Brilliant. I really enjoyed the Yamamoto F/W collection. The trainers were jarring at first, but they actually worked really well with the movement of his looks. 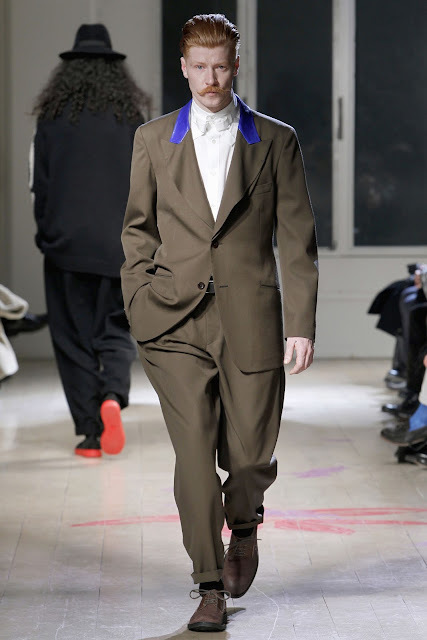 The great thing about this collection is not only that it is wearable by men of varying ages and body types, but the collection is also appealing to them. The fabrics are interesting, the cuts are daring and the proportions are great. Really loved this post. Yohji Yamamoto is by far one of my favourite designers. I definitely need to try the uniqlo t-shirts and Muji too! I never think to buy from Muji other than stationary! pretty immense body of work. glad there wasn't a retirement. really like all the model choices too. i like the blue collar detail on that neutral suit!